The paleos, for reasons not entirely clear to me, disapprove of eating potatoes except for yucca and sweet potatoes. So this recipe contains no spuds yet is said to taste like potato soup. I got the recipe from the cookbook Paleo Cooking From Elana’s Pantry by Elana Amsterdam, a Christmas gift from my sister (thanks Jeanine!). As usual I modified it to fit the ingredients and quantities I had on hand. Guess you have to buy the book to see the original as it’s not on her website. Make sure you rinse or soak the leeks throughly as they are usually sandy and gritty. It serves about five and prep and cook time is over an hour so if I make it again I’ll double the quantities and freeze the leftovers. Heat the coconut oil in a large saucepan over medium heat. Sauté the leeks for 10-15 minutes until lightly browned. 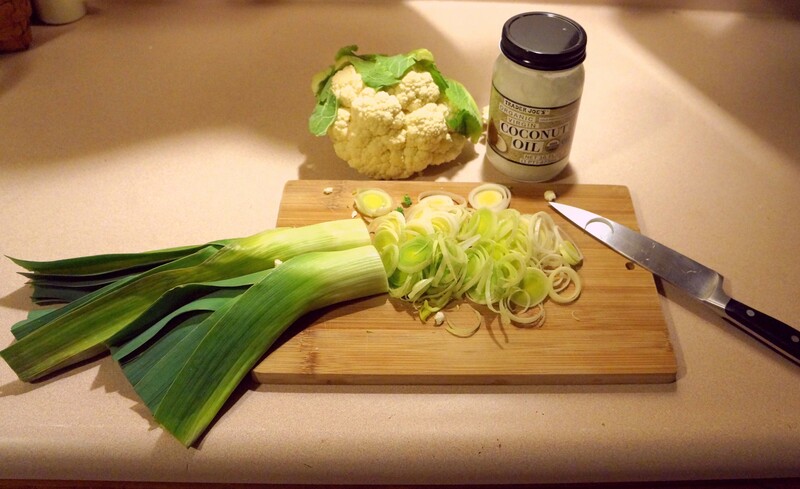 Add the cauliflower and Sauté for 15 minutes, until tender. Add the stock and water and bring to a boil. Lower the heat and simmer for 20 minutes. Remove from heat and let cool for 15 minutes. Blend with blender or immersion blender, add salt and pepper. Reheat, garnish with fresh thyme and serve. Though I didn’t think it tasted that much like potato soup, it was tasty (Ina Garten: ‘Delicious!’), the fresh organic thyme garnish adding a lot. If I make it again I’ll use two more cups of stock as per Ms. Amsterdam’s recipe both to thin it to proper consistency and to leave more for the freezer. How long did I sleep? Still dark in the east.